Find or check out your favorite Hoopz spot in the SoCal region! 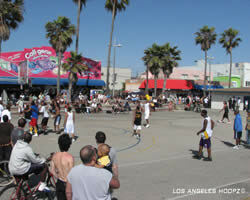 We have organized a list of all the hoop spots in Los Angeles. Each has been found and approved by the Hoopz Staff. Submit your favorite spot and see if it will be the next Hoopz Staff certified spot! IMPORTANT NOTE: PLAY AT EACH OF THESE LOCATIONS AT YOUR OWN RISK. THE HOOPZ NETWORK IS NOT LIABLE FOR ANY INFRACTIONS AND THIS IS USED SOLELY FOR ENTERTAINMENT//KNOWLEDGE ABOUT PLAYING SAFE AND & FRIENDLY BASKETBALL. - Nice facility with plenty of parking. - Skate park, playground for the family. - Open Gym: Monday, Wednesday, and Friday (check for times/availability). - Great crowd but come early to play 5-5 and/or 3-3. - Open gym Monday thru Thursday 9am to 3:30pm. - Games usually pick up around noon. - Great outdoor courts with oversized dog park and golf course. - Family orientated environment with many courts & competition. - Occasional good games after 4pm. - Comprised of students and people in their 20's. - New hoopz fans come early to get a down. -Occasional good games with scrubs from all around Hollywood and the Universal area. -Rare to catch real games there but fun to play with 9 and half foot rims dunk sessions. -All day ball but known for its nighttime hoopers with the lights shining all night. -All week long from 6pm to 10 pm is the best time to run. 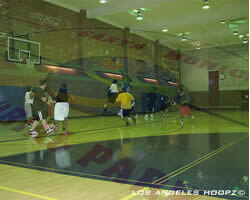 -Two full-size basketball courts with average to high level ball players. -Come early to play beginning at 3pm (weekdays) or 11am on Saturday mornings. -Eclectic and diverse characters with plenty of trash talking and a good family atmosphere (large playground). -Evening runs with top quality players until midnight. -Bring ya game you never know who'll be there to surprise you. -Games for the day commence at 11am. -Nice indoor lighted gym with a clean, friendly environment. -Spot has future and current celebrities in full form i.e. Joe 'Belly Bean' Bryant and Ludacris, etc. 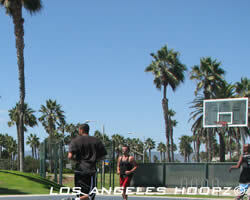 -Great spot to play when the SoCal weather is not in full form. -Early morning runs beginning at 7am to 8:30am. -Afternoon runs from 6pm - 10pm. -All day easy run on the weekends. -Open gym 9am to 2pm Monday and Wednesday. -Outdoor play begins around 4pm or 5pm until sunset. 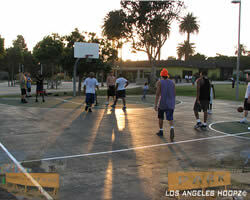 -Two full-sized outdoor courts for 5 on 5 or 3 on 3, depending on the hoopz fans. -Hollywood crowd, comedians, high schooler's, and fun environment. -Open gym Monday - Wednesday 12pm to 3pm. -Outdoor games all afternoon especially after 5pm "until." -Hoop with celebrities and old schooler’s that know the game. -Open gym Monday thru Friday 9am to 3pm. -Good practice facility but lacks the quality competition. -Outdoor games commence at 4pm until 11pm, depending on the crowd. -Crowd includes those from the Jewish community and surrounding areas. 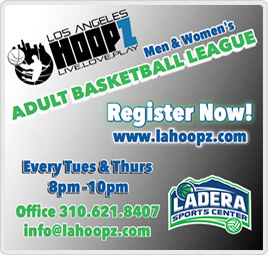 -Every Monday and Wednesday 2pm to 5pm for up-and-coming hoopz fans. -Sunday morning from 8am to 11am, make sure you bring your squad or sit for a while. -Hear a li' demo of the best of Power 107. Noah and Time holding the court. -Great quality outdoor court with an eclectic bunch. -Lunch-time special for 3 on 3, packed with skilled and the 'average Joe'. -Best games commence at 6pm to 10pm (great late night lighting). -Weekday's (Mon., Wed., and Fri.) beginning at 10:30am until the cow's come home. -Sunday mornings during the summer is the best starting at 10am or earlier. -Great diversity of ballers and ethnicities with strong unity. - Great outdoor games begin from 4pm to 10 pm. - Best games at night with average student ballers and coed basketball. -The Wooden Center (Indoor gym) for all day indoor games for 5$ entry fee for non UCLA students with an all day pass to entire facility. Men’s gym for NBA and good college players around noon has been the best run in the city this summer. - Games played year round except on cloudy or rainy dayz. - Players all over the world come here, all day & night. - Come early and leave late. - Various events, fun for the entire family. -Shooters Beware: Double rims and uneven pavement. -Games commence around 3:30pm until sunset. -Two full sized courts for intermediate and advanced Hoopz Fans. -Schedule as follows: Tuesday & Thursday 12pm-3pm; Friday 8-9:30pm; Sunday 10am-1pm. -Two indoor courts and two outdoor courts. -Good competition ranging from athletic to intermediate skill. -Located just north of Hollywood Blvd on Las Palmas. -Gym open Monday - Friday at 10am to 3pm, also Saturday - Sunday -from 8am to 4pm. -Best games are around the lunch hours. -Elementary school on the Melrose strip at the cross of Formosa. -Join the mailing list and bring your squad for 3-3 or 4-4 full court. -Fast and explosive for hoop fanz 6'3 in height and under only. -VIP for summer time tournaments.